Thank god Rod Stewart got sick. Sorry Rod, but it’s true. The ‘rents were down from bonnie Scotland to see the croaky crooner last Thursday. When he cancelled due to a ‘bronchial virus’ we decided to hit the Mayfair branch of Burger and Lobster. And although this unique restaurant is probably a decade old in hipster years, it shows no sign of stopping. The queue is still around the block, the atmosphere is buzzing, and the food (burger or lobster, the only choices) is phenomenal. Read on for the London Lassie‘s ratings. 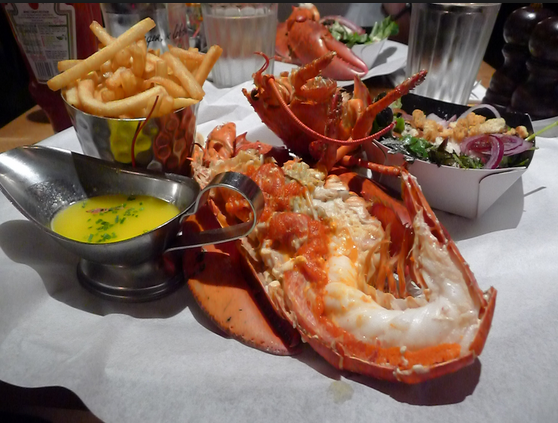 Although everything on the munchtastic menu is £20 – a bloody bargain for a whole lobster – the drinks aren’t as good value. Don’t let the food fool you, you may end up spending double on drinks (which is what we did). Burger and Lobster branches in cooler venues such as Soho may have a hotter clientèle. The Mayfair eatery mainly consists of married businessmen, camp Bond Street boutique workers and Chinese tourists. Nevertheless, a few bonny faces. They get half a point because my b-e-a-utiful mummy was there! The place goes like a fair and the bar is teaming with punters awaiting a table. Because of the ever growing queue outside, you get the feeling you’ve sneaked into a really hip party. The waiters are also extremely friendly despite being under an expected amount of stress. 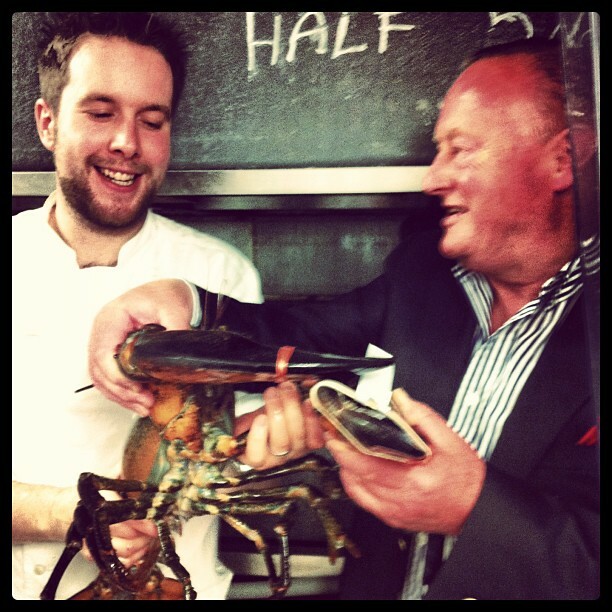 However, the main chunk of points in the banter scale has to be for the fact that after requesting to check out the 11lb lobster (£165 if you want this…) the head chef (Ken, or Kev?) escorted us into the kitchen to shows us the gigantic sea creature and then proceeded to take us downstairs to show us the huge lobster tank! They sell almost 1,000 a day, you can imagine the size! Would I return? Absolutely. Go eat. 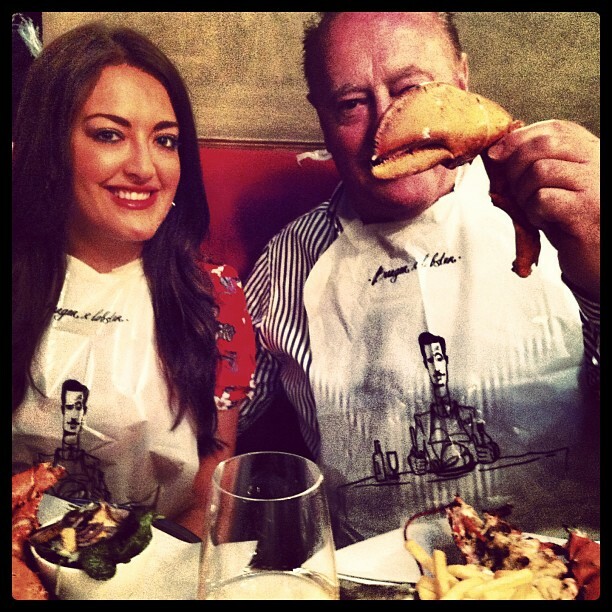 Tucking in donned with Burger and Lobster bibs!